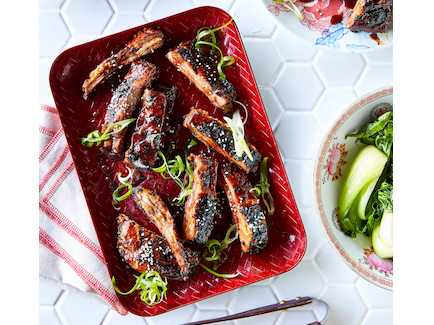 These sweet and sticky lamb ribs are so finger-licking good. In a medium bowl add the oil, hoisin, soy sauce, maple syrup, garlic, ginger and 5 spice powder. Season and stir to combine. Place the lamb ribs in a large snap lock bag or glass container, add the marinade and rub to coat. Marinate at room temperature for 30 minutes. Preheat a barbecue to medium heat. Drain ribs, reserving marinade. Add the ribs and cook until browned and charred on all sides, turning regularly to prevent burning, for 15 to 20 minutes, or until cooked through. Et aside covered with foil to rest for 5 minutes. Heat the reserved marinade and 1/3 cup (80ml) water in a small saucepan over medium-low heat for 4 to 5 minutes until slightly thickened and heated through. Is using riblets/single ribs they will only take about 10-15 minutes. Nothing says spring more than a BBQ with friends and family, soaking up the warm weather and showing off your cooking skills. But even the beloved BBQ needs spicing up – whether it's experimenting with different cuts for different budgets, getting the most out of a (dodgy) beach BBQ, or achieving BBQ greatness on your kitchen stove – by incorporating these tips into your next meal, you'll be the boss of the BBQ in no time. Shane Delia, owner and head chef at Maha Restaurant and Biggie Smalls, is a big fan of the BBQ, using it to entertain guests every chance he can. Shane has compiled his top tips for barbecuing this spring, to help you create the perfect lamb dish and get the most out of your outdoor grill. "Australians love to be outdoors and will use any excuse to fire up the BBQ as soon as the weather warms and the days get longer. Cooking lamb on the BBQ is not only simple, but also one of the best ways to cook a range of lamb cuts." Forequarter chops – Packed full of flavour and perfect for marinating, chops stay moist as they cook making them great for the BBQ. Lamb leg – Did you know you could slow cook on the BBQ?! Pop the hood down to slow cook your lamb leg, or opt for a butterflied leg for a quicker cooking time. This cut is great for feeding a whole group and won't break the bank! Lamb sausages – a classic that's sure to please everyone. Don't pierce the skins when cooking as the juices will escape causing the sausages to become dry. Lamb ribs – An incredibly juicy and flavoursome cut that is perfect for the BBQ. Cook them as is, or marinate, for a mouth-watering treat. Loin chops – known as the lamb 'T-bone', the loin is an incredibly tender cut that is suited to cooking over high heats. As beach BBQs don't have hoods, stick to cooking cuts that are suited to grilling hot and fast – such as cutlets, forequarter chops, loin chops, lamb mince patties, sausages and kebab. As with all barbecuing, ensure you're cooking on a very high heat to seal in the juices and create a delicious crust. Do as much prep as possible before you leave for the beach to make your life easier! For lamb kebabs, cut the lamb up and place in a snap lock bag with the marinade so you only need to thread the meat onto the skewers when you're ready to cook. We're all for mixing and matching flavours - but when they're yours! Make sure to clean the BBQ well before and after use, scraping off any material with a spatula and wiping down with a paper towel. For a simple cleanup, place foil or baking paper on the cooking surface before grilling your lamb. Not all of us have outside space. Don't have a BBQ? Don't fear! You can achieve the same great results from your kitchen. By cooking in a pan using a high heat, you'll trap in the juices and create beautiful searing and caramelisation. If you are using a pan on your stovetop, heavy-based cast iron pans work best as they ensure the high heat distributes evenly. This will result in a delicious crust on your lamb, similar to what you would get on a BBQ hotplate. With daylight savings, we've all gained an hour of evening light, enabling us to still BBQ after work – give lamb mince patties on the BBQ a go or visit your butcher for pre-marinated and butterflied lamb legs to feed the whole family. Preparation is key. Pop your desired quick-cook lamb cuts into a marinade and place in the fridge in the morning. As soon as you get home from work you can take the lamb out and have dinner cooked in no time! Lamb mince can make delicious hamburger patties or koftas, which are perfect for barbecuing. Try adding some Middle Eastern flair and serve with hummus, marinated roast capsicum and flat breads. Lamb sausages are an easy crowd pleaser! They are easy to prepare and loved by everyone. Chump chops and chump steaks are perfect for grilling. The fat renders nicely resulting in a tender and juicy cut.